(W)hen ideas people thought would succeed are evaluated through controlled experiments, less than 50 percent actually work out. . . . use data to evaluate an idea rather than relying on . . . intuition. . . . but most businesses aren’t using these principles. . . .What’s important, Kohavi says, is to test ideas quickly, allowing resources to go to the projects that are the most helpful. . . . “The experimentation platform is responsible for telling you your baby is really ugly,” Kohavi jokes. While that can be a difficult truth to confront, he adds, the benefit to business—and also to employees responsible for coming up with and implementing ideas—is enormous. This articles further supports my thesis that Evidence-based practice, analytics, measurement and practical experimental methodology are closely related, mutually supportive, and a natural synthesis. I do believe that, while trusting science is an important idea, that trust should also be tempered because it is a tools for decision-making and acting, not a general method for living. A successful life of practice is a balance between the empirical and the aesthetic. You could say that aesthetics, looking at life emotionally and holistically is the real foundation of our experience and how we live life. Within that frame, it is helpful to step back reflexively and consider the use of empirical tools to benefit our experience, but without denying our aesthetic roots. Wittgenstein wrote on this (from the Stanford Encyclopedia of Philosophy article on Wittgenstein’s Aesthetics). “The existence of the experimental method makes us think we have the means of solving the problems which trouble us; though problem and method pass one another by” (Wittgenstein 1958, II, iv, 232). For Wittgenstein complexity, and not reduction to unitary essence, is the route to conceptual clarification. Reduction to a simplified model, by contrast, yields only the illusion of clarification in the form of conceptual incarceration (“a picture held us captive”). the naturalizing of aesthetics—(which) falsifies the genuine complexities of aesthetic psychology through a methodologically enforced reduction to one narrow and unitary conception of aesthetic engagement. I have undertaken here to show that these two abilities–the ability to recognize the possible falsehood of a theory and the identification of evidence capable of disconfirming it–are the foundational abilities that lie at the heart of both informal and scientific reasoning. These abilities lie at the heart of critical thinking, which similarly can be regarded, at the most global level, as the ability to justify what one claims to be true (Kuhn, 1993). Some background considerations and directions for future thoughts and research. I’m taking the perspective that what cognitive control we have over our decisions and actions, is mediated by our beliefs, theories, schemas and prior knowledge. Without this mediation everyday actions would represent an unbearable cognitive load. Although there are good strategies for enabling critical thinking, at it’s core, critical thinking is the ability and disposition to seek disconfirming evidence and use it to change our minds (beefs schemas, theories, etc. . . ). Although we often equate scientific thinking with the scientific method (hypothesis testing), the core of it’s reasoning is also the disposition to seek and make use of disconfirming evidence. Evidence-based organizations must actively support critical thinking through their culture and in the organization of their internal processes and practices. Practice validity (seeking evidence for the validity of organizational practices) is the ability to justify the efficacy of our actions, just as Kuhn considers critical thinking to be a way to justify our claims to truth. A shout-out to Harold Jarche who’s post Critical thinking in the organization led me down this primrose path. Kuhn, D. (1993). Connecting scientific and informal reasoning. Merrill-Palmer Quarterly, 39(1), 74-103. It intuitively seems to me that there are two way of applying evidence in Evidence-based Management. One I’ll call evidence-based decision-making (EBDM), bringing evidence into decision processes. The other I’ll refer to as evidence-supported interventions (ESI), specific practices that are empirically supported. psychological theories of intuitive thinking cannot match the elegance and precision of formal normative models of belief and choice, but this is just another way of saying that rational models are psychologically unrealistic ( p. 1449). Nonetheless, evidence should inform decision processes and I believe that evidence supported protocols, as one example, can prepare the decision space for better decision-making outcomes. However, this type of process also begins to bring me closer to the second way of applying evidence; through evidence-supported interventions. specific interventions (e.g., assessment instruments, treatment and prevention protocols, etc.) determined to have a reasonable degree of empirical support. (Other names might include evidence-based practices, empirically supported treatments, or empirically informed interventions.) In implementation settings, ESIs function as standardized practices; practices where all or a portion of the operational, tactical, logistical, administrative or training aspects of a practice are able to conform to a specific and unified set of criteria. In other words, the contexts of implementation will allow practice to be replicated exactly as they were defined and constructed in supporting research. In being evidence-based, it is important that critical issues flow both ways. If the contexts do not allow replication, or present confounding variables and complexity not addressed in research, it will necessarily reduce the level of support that can be claimed for any research supported practice. Probably, it is fair to say that the quest for causal explanation is theory driven, whereas causal description is not necessarily grounded in theory. ESIs, because they focus on replication, do not need to be as concerned with the fact that they are relying on causal descriptions. EBDM, however, are using evidence in a more theoretical way than in the replication of a standard practice. Because they are dealing with complex and context independent reasoning, they need evidence that is valid in a causal explanative manner. Two observations – From a strict positivist perspective, this creates a problem for EBDM because of the difficulty in achieving a necessary level of causal explanation. Positivism can live better through a ESI approach because it can depend on causal description. Instead an EBDM approach must adopt an argumentative type role in validating evidence. This is the approach that validity theory has taken. Validity theory began with a positivist framework that was centered on a criterion approach to validity. As it became more and more apparent that constructs were the central concern (theoretical concerns) it adopted a unified construct validity perspective that needed an argumentative approach. This is an approach where validity is never an either or proposition, but rather a concern for the level of validity achieved. While this is not necessarily the most clear way, it is very pragmatic and practical and able to be implemented across a wide variety of practice locations. EBDM is concerned with supporting naturalistic decision processes with evidence that is empirically and theoretically supported and can be a easily included in that decision process. ESIs are concerned with practices, protocols and processes that can function in a standardized manner through the replication of empirically supported research interventions. Kahneman, D., (Dec., 2003). Maps of Bounded Rationality: Psychology for Behavioral Economics, The American Economic Review, Vol. 93, No. 5 , pp. 1449-1475. Mullen, E.J., Bledsoe, S.E. & Bellamy, J.L., (2008). Implementing Evidence-Based Social Work Practice, Research on Social Work Practice, Vol. 18 No. 4, July 2008 325-338. Otto, H., & Ziegler, H., (2008). The Notion of Causal Impact in Evidence-Based Social Work: An Introduction to the Special Issue on What Works? Research on Social Work Practice, Vol. 18 No. 4, July 2008 273-277. Identify Bottlenecks; places where evidence is not being used or where analysis is breaking down. Plan for sharing learning and making this approach a part of the organizational culture. The latest issue of The Chronicle of Higher Education (11-18-09) reports on the attempt to develop this approach at Indiana University in Bloomington. David Pace’s history courses at IU attempts to develop two skills that he feels are core to the discipline of history: “assembling evidence and interpreting it”. The Chronicle reports that the history curriculum at IU is now organized around specific analytic skills and the different course levels by which they should be mastered. Volume 98 of the journal New Directions for Teaching and Learning was devoted entirely to this topic. It includes examples of the decoding methodology as it is applied to history, marketing, statistics, genetics, molecular biology, astronomy, the humanities, physiology, and a specific chapter devoted to supporting the assessment step. I have a kind of initial excitement about this approach. I’ve known that learning and education are important to all kinds of organizations today and I’ve always been enamored by the meme that businesses must become more like universities. Decoding the Disciplines is a potential methodology that could crosses over between these two very different universes and also provide a model for organizational learning. Middendorf, J. & Pace, D. (2004). Decoding the Disciplines: A Model for Helping Students Learn Disciplinary Ways of Thinking, New Directions for Teaching and Learning, 98, 1-12. Glenn, D (2009). A Teaching Experiment Shows Students How to Grasp Big Concepts, The Chronicle of Higher Education, Nov 18, 2009. Tracy at the Evidence Soup Blog has a recent post that got me thinking that the processes supporting Evidence-based Practice (EBP) must be centered on actual clinical practices (not some abstract formulation of practice) and that these processes should include both research and clinical expertise. Tracy reviews a article in the July issue of Clinical Child Psychology and Psychiatry (How do you apply the evidence? Are you an improver, an adapter, or a rejecter? by Nick Midgley). I hope to review the article myself soon, but my library resources do not yet have the July issue, so my take at this time is dependent on Tracy’s description. Innovators seem to be focusing on a top down “push” approach. First, while research in this vain is important, technology and networks are moving toward a pull approach; giving answers to practitioners when they need it. Secondly, in addition to a top down approach there is also a need for a deep bottom up understanding of practice: understanding practice needs and devising how dissemination models can meet these needs. Understanding transfer problems may have the question backwards. Adapter – I like this approach for the most part with two caveats. First it looks like it is falling into the qualitative / quantitative divide that I dislike. I believe that you choose the methodology to fit the research question. Qualitative research is needed to find a deep understanding of practices or to unearth value issues. But, I’ve seen too many qualitative studies that tried to answer quantitative type research questions (i.e. which intervention is better). 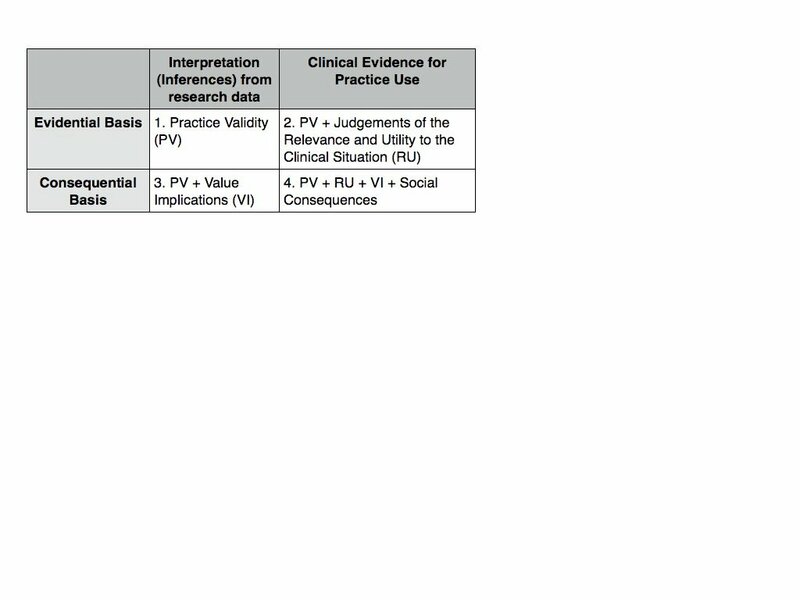 Coming from a validity perspective, I believe that all kinds of data can be integrated to arrive at an inferential judgement on practice validity. Especially in medicine, I think we often have correlational based research data, but without a lot of theory and practice-based understandings. We need to understand practices from multiple perspectives that come together like the pieces of a puzzle to make a coherent picture. Messick uses a matrix which I have used as well, but it could also be viewed as a stepwise process. Step 2. P V + Clinical Evidence and Judgement forms the evidentiary basis for the Relevance and Utility (RU) of the practice.
. . . science is already a wiki if you look at it a certain way. It’s just a really, really inefficient one – the incremental edits are made in papers instead of wikispace, . . . And the papers are written in a highly specialized form of text that demonstrates the expertise of the writer in the relevant domain, but can form a language barrier to scientists outside the domain. . . . How can we get to enough technical standards so that this kind of science can be harvested, aggregated, and mashed up by people and machines into a higher level of discipline traversal? . . . But the language barrier among scientists is preserved – indeed, made worse – by the lack of knowledge interoperability at the machine level. It’s the Tower of Babel made digital. Two really important issues in scientific communication and dissemination that are critical for technological progress and for evidence-based practice. One is the organization of scientific findings scattered through various journals instead of collaborative consolidated instruments like wikis. Time is the real information problem today and some form of wiki is the answer. The second issue is knowledge interoperability. Precise language is important in scientific communication, but I still get the feeling that current writing styles and vocabularies in many disciplines, when you look at function, have more to do with politics than communication.